The first months of a baby’s life is both exciting and difficult. New parents especially are adjusting to a new life, learning how to take care of a newborn. Although they may not do much except eat, sleep and poop, newborns still have wakeful moments. In these moments, they want to know more about their surroundings and interact with their parents. This is the time to start bonding with your little one and stimulate his or her senses. Good thing is, you don’t need some fancy toys or a lot of preparation to interact and play with your baby. The purpose is to nurture a good relationship and entertaining the little one. In fact, you probably are doing most of these things already but if not, here are some tips and ideas to inspire you for some parent-baby fun. Your newborn does not understand any of your words yet, but they love looking at faces to interact with grown-ups. As much as you love to stare at this cute little thing, he or she adores seeing smiles. In fact, some babies are a lot more interested in people than in toys. Spend time daily looking at each other, directly at each other’s eyes so your kid knows he or she has your whole attention. Smile at them or make faces and see them respond to you. Do not feel scared if you are being stared at, the little one is also memorizing the faces of parents. You don’t need to have complex and deep talks with your child yet, especially since it’s all gibberish to a baby. Instead, tell him or her about what you are doing, whether you are preparing a bath, preparing food or simply how much you love him or her. Not only does it teach them that talking is a social activity, but they start to hear words they will utter months later. They also learn what things are called when you point or show them at the same time. Do not feel silly if you speak to them with a higher pitch. Research says babies like this more and are more likely to respond. Your newborn is most likely feeling cold and overwhelmed in the outside world, which is why keeping skin-to-skin contact will not just strengthen your bond, but will also reassure him or her that mom and dad are always around. You may also invest in a baby carrier to keep your baby always close. The sound of your heartbeat is very familiar and reassuring to a newborn. Babies coo as a form of communication, and when adults imitate their sounds and facial expressions, they interpret it as you answering them back. Pretty soon you will have your own little conversations without even using any word! Your newborn knows the sound of your voice from the womb, so when you sing, it is very soothing for him or her. Even better, singing and using hand motions will engage them more and teach them to move their arms and hands. You can also try dancing for or with them to entertain them. These activities make babies smile and laugh, so you know they love it as much as you do. Your newborn’s sense of sight will develop dramatically during the first months. In the beginning, it will not see much though the eyes are open. The baby will then be able to see contrasting colors like black and white and eventually be able to see moving items. Give your little one enough to see by investing in a play gym or even just showing him or her ordinary items with stark contrasting colors. Another important thing to do is to stimulate the baby’s sense of touch through offering items with a variety of textures. At the same time, the newborn’s ability to grasp will be developed by giving him or her toys to hold. Another way to improve the tactile sense is to give your baby a massage. You can use your hands to enhance receptors on the skin and at the same time, make your baby more relaxed. 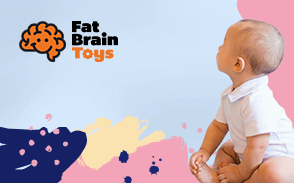 Check out our list of toys for newborns. Your baby will spend more than enough time on its back, and there is a risk of having a flat skull because of it. This is why tummy time is very important. More than that, it is how your newborn will develop the muscles to learn all other skills like rolling over, sitting, crawling, and walking. The little one will not enjoy it at first, especially when he or she cannot lift the head yet. But it is good to just place the baby on its tummy a few times a day but only for a few minutes so it gets used to it. There are also different ways to do it, like letting your baby lie on its belly on top of you or by carrying it on its belly (like a superhero trying to fly). Newborns will not understand books nor have the patience to let you finish one. The point is to just create a positive association with books as early as possible. They get to develop their eyesight by looking at pictures and they are exposed to a wider vocabulary. Studies show that reading out loud to your baby will benefit them in the long run as well. Plus, you can start a bedtime reading routine with your little one. Although newborns will have no memories of their first months, their interactions with parents will imprint in their personalities. Even just showing them what you do everyday is a way to interact with them so do not worry about buying the right toys or doing the right activities. Babies that are stimulated and that play with grown-ups will have a greater feeling of security and have a stronger bond with mom and dad. Physically, their brains will create more neural connections due to the information they acquire about the world, and emotionally they will be more curious and feel more confident to explore the world around them.